Unbelievable changes are coming. I remember having a conversation the other day. I told my wife that our kids would freak out if we told them we didn’t have Internet growing up as kids. The Internet today just seems fundamental, and certainly to a Millennial, they wouldn’t understand the concept of its absence. Just as the Internet changed our lives, so too will artificial intelligence. Artificial intelligence will change real estate shopping and everything else too. I just watched a live video whereby you take out your smartphone and open the camera. In your screen is a lamp. Your phone will show you other accessories that match that style, so you could shop for and put together a room that matches. I watched another video where the camera showed a woman in an outfit. Artificial intelligence scanned billions of images and within a second pulled up where you could buy that outfit, along with other similar outfits, and prices. So, imagine walking down the street and noticing a home that looks good to you. It’s not for sale, but you like the look. Your phone could instantly find other homes on the market right now that look just like the one you love, show you the price, and even setup a showing appointment to see it. Sound futuristic? Perhaps, but it is coming. Keller Williams has already been working on this for its agents. Currently I can ask our artificial assistant Kelle many things, and instantly she will give me results that used to take hours. Let’s say I have a client moving to Bowling Green, KY. I whip out my phone and tell Kelle, “show me Bowling Green agents with the CRS designation.” Kelle spits out agents with their CRS designation. There is a ton of activities I can ask Kelle to do while I’m in the field and Kelle only gets smarter. As we ask her to do things, she learns and becomes capable of more. Google held its I/O conference this week and announced some amazing things. Companies like Google, Microsoft, IBM, etc are all working on artificial intelligence. Artificial intelligence offers the ability to ask, scan, analyze, and deliver billions of pieces of information instantly. Our military is scanning and analyzing photos on video and delivering results with over 90% accuracy. It used to take people days and months to scour video. Now our defense department can search for and do things in minutes. Our company is working on analyzing photos in MLS. Let’s say you like a certain kind of counter-top, or a certain color cabinet. We’ll be able to ask, show me all kitchens with Black Quartz priced below $450,000. Having the ability to scan photos and deliver results would save an agent or consumer many hours perusing photos of listings. We use big data to search for buyers for our listings. When we list a home, we serve up ads on that home to consumers that match certain criteria. For instance, we just listed a nice 4-bedroom pool home in Belle Lago. We’ll be holding it open this Saturday from 1-3 PM. We’ll serve up online ads for buyers looking to purchase in the Estero area. Big data allows us to target specific buyers. It helps us sell homes faster and for more money for our clients. Big data is great, but artificial intelligence is what will tie it together. The pentagon can have all the videos it wants, but what good is it when it sits in a vault and is too big to work with? The same is true for real estate. Being able to ask and analyze data is key. Many sellers interview agents and ask which one can save them 1%. The real question should be, which agent can sell my home for 3% more and 20% faster. Saving 1% doesn’t save anything if they sell it for less and take longer. If you want to search the MLS like a pro go to www.LeeCountyOnline.com. 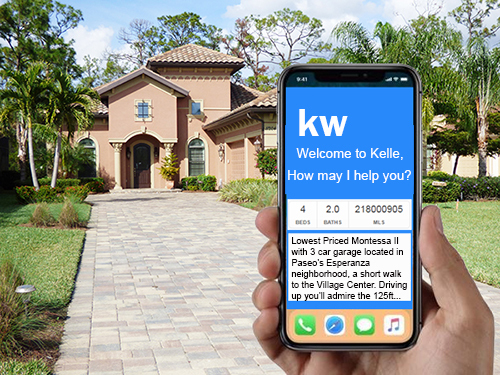 If you’re thinking of selling, call Sande or Brett Ellis 239-489-4042 and find out how Today’s systems just might help sell your home faster, and for more money.